Matias Aguero made his Italy debut against Tonga in 2005 and has gone on to secure a regular place within the international setup. Born in Argentina, Aguero moved to Italy as a boy and began his rugby career with Bolognan before stints with Rovigo and Viadana. 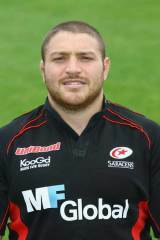 He joined Guinness Prermiership side Saracens from Viadana after representing Italy at the 2007 World Cup. Unfortunately for Aguero, a neck injury sustained in training at the World Cup ruled him out of action for the first two months of his stay in England. Other niggling injuries continued to blight his season, and he only returned to full fitness in time for Italy's summer tour to South Africa and Argentina in 2008.